Manage multiple child models in a form, supporting validation for each model. For a single child model see Advanced Multi-Model Forms. Simply click a button to add another child, and it will magically appear on the form. Consider a Product model that has multiple Parcel models related, which represent a list of parcels that belongs to the product. 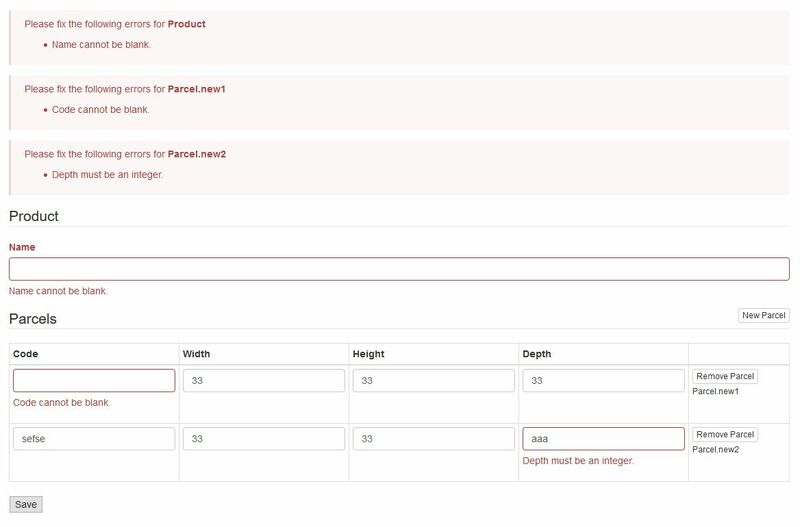 In the form you want to allow adding any number of parcels and each one should validate according to the model rules. Now we get to the advanced form, but don’t worry, it’s all quite straight forward. We need a model to handle loading, validating and saving the data. The ProductForm class is used in actionUpdate() and actionCreate() methods in ProductController. The views views/product/create.php and views/product/update.php will both render a form. The form will have a section for the Product, and another section for the Parcels. Parcels can be added by clicking the “New Parcel” button, which will copy a hidden form. When updating a Product, the existing Parcel rows will be displayed. After saving, each Product and Parcel field will be validated individually, if any fail the error will be displayed at the top as well as on the errored field. Inside the above form we render the form fields for the parcels.